Michael Darrow "Mike" Greenberg (born August 6, 1967) is a television anchor, television show host, radio show host for ESPN and ABC, novelist, and has had his Twitter feed referred to as "the white Magic Johnson". At ESPN, he hosts the weekday evening, most often Monday, SportsCenter and ESPN Radio's Mike & Mike show with Mike Golic. At sister network ABC, he was the host of Duel, which aired from 2007 to 2008. As of 2011, he co-hosts the 6 PM Eastern Monday SportsCenter editions during the National Football League season with Golic. Greenberg was born to a Jewish family in New York, New York, and graduated from Stuyvesant High School in 1985. In 1989, Greenberg graduated from Northwestern University, where he joined the Theta Chi Fraternity, and started work as a sports anchor and reporter at WMAQ-AM in Chicago. He left WMAQ in 1992 to work for WSCR-Radio as a reporter (covering events such as the World Series and the Super Bowl) and talk show host. From 1993 to 1995, he also wrote a weekly syndicated column for the California-based Copley News Service. In 1994, he added reporting for SportsChannel Chicago to his résumé. In 1995, he left SportsChannel Chicago to work at CLTV, becoming an anchor, reporter, and host of a live call-in show. He left Chicago for ESPN in September 1996, where he became one of the first hosts of ESPNEWS when it began broadcasting in November of that year. 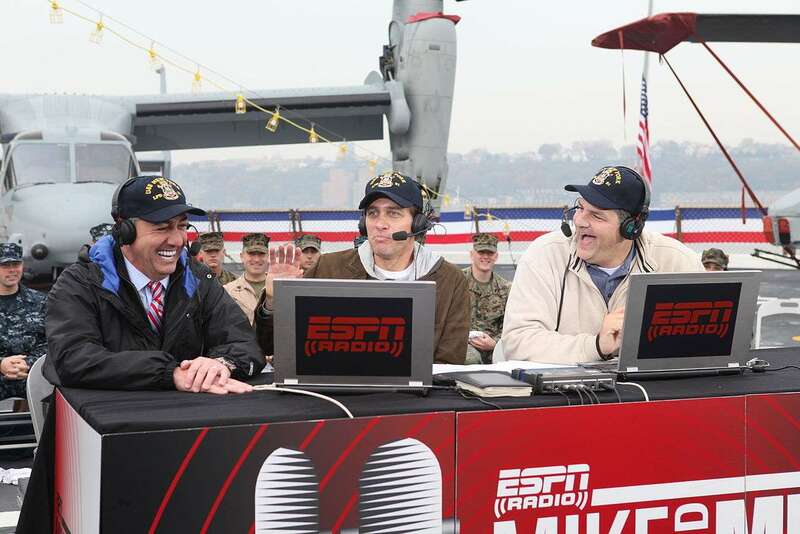 In 1999, with ESPN Radio airing in just four markets, Mike Greenberg was approached about returning to radio to be a part of a morning drive-time show with Mike Golic as co-host. Greenberg agreed, with the understanding that he would continue anchoring SportsCenter on a regular basis. On April 26, 2004, the show started a regular simulcast on ESPNEWS. Because of their continued success, the duo moved to ESPN2 in January 2005. One of the most popular segments of the entire year on Mike & Mike is the annual "Sheet of Integrity" wager, a bracket wager based on the NCAA Men's Basketball Tournament and the massive ESPN.com bracket contest. The bet originated after Mike Golic told of how he would enter a massive number of sheets into different pools to win the money involved in the pool. Greenberg, believing picks required a sort of integrity, insisted that any such entrant be required to enter only one "Sheet of Integrity". Golic would select one of his (presumably) dozens of sheets against Greenberg, with the loser having to perform a humiliating stunt, usually on the air. The first year, Greenberg won and Golic had to have an eyebrow wax on the air. The next two years, Golic won, and Greenberg had to wear the University of Notre Dame Leprechaun mascot costume on the air, the second time on the Notre Dame campus. In the 2007 competition Greenberg, an admitted die-hard New York Jets' fan, agreed to wear a New England Patriots' jersey to a Jets' game and to milk a cow live on-air. Greenberg received advice about milking a cow from ESPN baseball analyst Buster Olney, who grew up on a dairy farm. Greenberg hosted the ABC game show Duel. The first season of the show, a week-long six-episode special, premiered on December 17, 2007, and ended on December 23, 2007. The show was renewed, and premiered its second season (consisting of ten episodes) on April 4, 2008; the show's sixteenth and final episode aired on July 30. On February 20, 2008, Greenberg appeared, along with his radio partner Mike Golic, on the soap opera Guiding Light as reported on ESPNradio.com. On April 18, 2012 Greenberg co-hosted Live! with Kelly. On March 7, 2006, Greenberg released his first book entitled Why My Wife Thinks I'm An Idiot: The Life and Times of a Sportscaster Dad, which reached 14th on the New York Times Bestseller list and was nominated in the 2006 Quill Awards for best sports book. In April 2010, Greenberg, along with co-host Mike Golic, released a book entitled Mike and Mike's Rules for Sports and Life. Along with the release, the two Mikes embarked on a 15-city book tour that included stops in New York City, Philadelphia, Pittsburgh, Chicago, Dallas, Boston, and Tampa. Greenberg released a novel entitled All You Could Ask For in 2013. He released the novel My Father's Wives in January 2015. Greenberg is a die-hard New York Jets, New York Knicks and New York Yankees fan. Mike Golic, his colleague on Mike & Mike, frequently refers to Greenberg as "Greeny." Greenberg resides in Westport, Connecticut with his wife Stacy, daughter Nicole (born September 2000) and son Stephen (born December 2002). ↑ "Mike & Mike: Greeny's Middle Name". ESPN.com. ESPN. March 25, 2014. Retrieved March 25, 2014. 1 2 Dresner, Stacey (March 28, MikGreenberg]. jewishledger.com. 1 2 Mike Greenberg Bio – Host of Duel – Sportscaster Mike Greenberg. Gameshows.about.com. ↑ Mike Greenberg's Game Show 'Duel' Debuts Tonight; Washington Post's Tom Shales Is Not A Fan | Media | Mike Greenberg. Faniq.com. Retrieved on March 25, 2014. ↑ Mike Greenburg and Mike Golic to Appear on Guiding Light. TV Fanatic (December 5, 2007). Retrieved on March 25, 2014. ↑ ESPN Radio's Greenberg To Co-Host Live! With Kelly. AllAccess.com (April 17, 2012). Retrieved on March 25, 2014. ↑ All You Could Ask For: A Novel by Mike Greenberg. Harpercollins.com. Retrieved on March 25, 2014. ↑ Mike & Mike in the Morning. Espn.go.com. Retrieved on March 25, 2014.